People sell their old or unwanted jewelry items and coins for a number of reasons. Sometimes it is simply because the items are broken, no longer worn, or outdated and unwanted. Other times it is due to financial reasons and the need to acquire money quickly. Still another reason is because metals prices are very high now, and they could drop back down at any moment. Whatever your reason for considering selling your gold, silver, or platinum items, there are several reasons why you should consider us first! Why Sell To D & M Perlman? While many claim to offer the highest prices, we deliver on our promise. We offer up to 50% more than generic gold-buying stores and “gold parties” because we are a jewelry store and manufacturer. NO COUPON NEEDED! For three generations we have been your trusted local jeweler in the Fox Valley. Our reputation depends on your COMPLETE satisfaction. We inspect and test your items for purity while you wait, and you’ll receive our BEST offer immediately! We also appraise and grade any diamonds or gemstones that you may have, and we will pay you top dollar for these as well! We own our own diamond cutting company, and we have ten showcases of estate and used jewelry in our store. So, we have many options and avenues of use for your items, and we always maximize the value for you! Because we’re a jewelry manufacturer, we also offer in-house repair and custom redesigning services. So if you have jewelry that is broken or you don’t wear anymore, we can repair it or create a brand new piece for you using your old items! Learn more. Because we’re a jewelry store, you can trade in your unwanted jewelry items for anything we offer – jewelry, watches, gift and collectible items, custom creations, even a jewelry or watch repair! We also buy silver and platinum, sterling silver flatware, pearls, coins, watches, and much more! 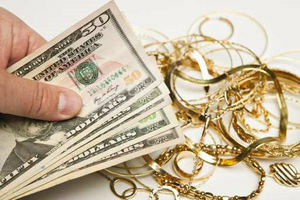 We are a direct recycler and user of gold, so selling to us cuts out the middleman that most buyers need to resell to. This ensures you get the most value for your precious items!